Warhol et al combines Carolyn Leigh’s colorful, vibrant response to the very visual poetry segments from Ars Warholica by Drew Krewer, to Warhol’s own work, and to work by other artist’s including Van Gogh and Basquiat. Mr. Krewer earned his MFA at the University of Arizona, where he received an Academy of American Poets Prize. His chapbook, Ars Warholica, is available from Spork Press. Warhol et al was created and exhibited at the University of Arizona Poetry Center as part of a collaboration between the poets and the book artists of Paperworks, the Sonoran Collective for Paper and Book Artists, Tucson, AZ. 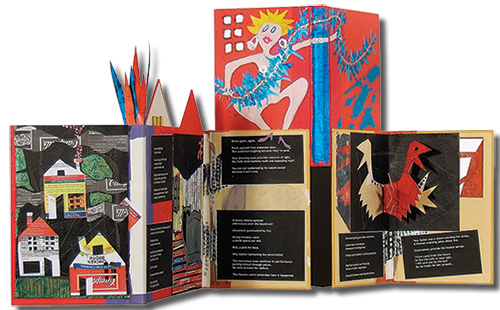 Warhol et al, an accordion-fold painter’s book with pop-ups, collaged papers and acrylic on multilayered and cut papers and board, 5 pages, 12.5” x 16.5” x 1.7” expanding to approximately 36”.